Northbound lanes of California Oaks Road will be closed between Hancock Avenue and Morning Dove Lane for up to three days while repairs are made on a water main break, City of Murrieta officials announced this afternoon. 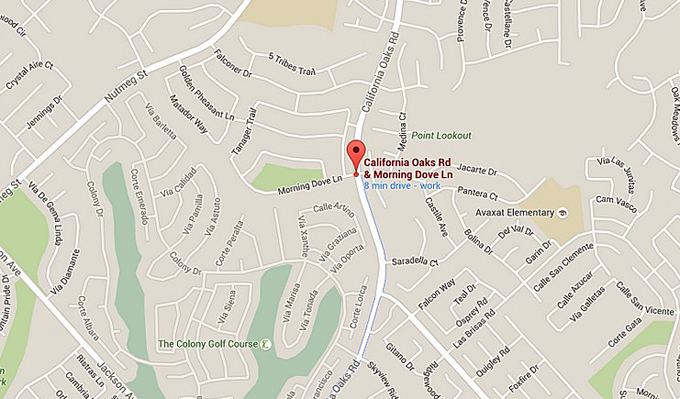 The break occurred at the intersection of California Oaks Road and Morning Dove Lane at about 3 p.m. The area is served by the Elsinore Valley Municipal Water District. Water service to the area is not impacted, according to city officials. Residents are urged to use alternate routes the next few days, although southbound lanes on Cal Oaks Road will remain open. Anyone with questions should contact the EVMWD Operations Department at 951-674-3146.